Disclaimer: This blog post is longer than usual (but there are NO affiliate links in it)!!! I can’t believe a month has gone by since my last blog post! Where does the time go? I thought I was supposed to have more time now that my kids are grown and out of the house!!! I’m in LOVE with her!!! 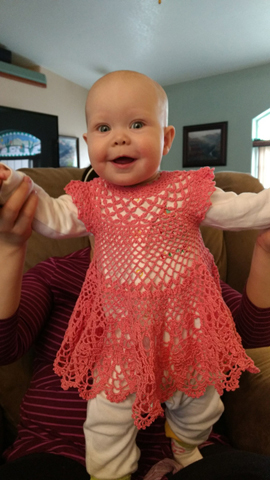 And the crochet dress that I made her actually fit!!! This pattern was from a booklet called “Frilly Frocks” by Lucille LaFlamme. All of the dresses in that booklet are really cute! It was too cold the day we tried the dress on Ruru, so she’s got warmer clothes on underneath! I also did something I’ve never done before in the past 12 months. I was the executor and trustee for my mom’s estate. My mom passed away in Feb. 2016 and left me to take care of her estate. I didn’t have a clue about what to do, but I learned a lot along the way. I think I’m all done with her estate because I got her trust tax return done and the K-1’s are in the mail to all of her beneficiaries. Whew! That’s a huge relief to have that behind me! I miss my mom very often, but I’m so glad to have the faith that she’s in heaven with my brother and daughter. I love you, mom! Thank you for all of your love and encouragement throughout my lifetime! Okay, now on to National Crochet Month. In the past, I’ve taken part in the Crochetville National Crochet Month blog tour. But I decided to take a break from that this year for various reasons. You can follow the Crochetville National Crochet Month blog tour, read about the participating designers, receive some free crochet patterns and maybe win a prize by checking it out here. Since I’m not taking part in the NatCroMo blog tour this year, I thought I’d talk about crochet and my designing career instead. I first learned to crochet as a teenager. My best friend taught me to crochet (thank you SOOOO much, Cheryl!). That was over 40 years ago and I’ve thoroughly enjoyed learning new crochet techniques and sharing what I’ve learned with others. In fact, I’ll be teaching 5 crochet classes at the CGOA Conference this July in Chicago (well, it’s actually in Itasca, just outside of Chicago)! Yeah! I LOVE teaching crochet classes at the conference!!! I meet so many fun, friendly crocheters there! You can read about all the classes that are being taught at the conference this year here. Registration will go live in 2 days (on March 8th), so you still have a little time to pick out your favorite classes and get your registration done right away so your favorite classes don’t sell out! The 5 classes that I’m teaching this year are Beginning Bruges Lace, Intermediate Bruges Lace, Beginning Filet Crochet, Intermediate Filet Crochet and Invisible Repairs (this is a brand new class on how to invisibly repair crochet projects and how to crochet an invisible seam in a crochet project). 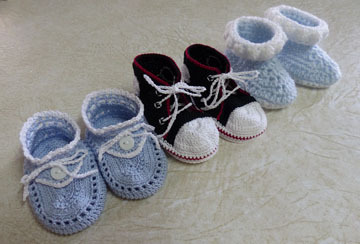 As you can tell by the colors, these booties are for baby boys! I really enjoy crocheting baby booties because they don’t take long to make and not everyone can crochet them, so they’re more unique gifts at a baby shower (instead of the baby receiving dozens of baby blankets)! I’ve spent hundreds of hours practicing my crochet skills and improving over the past 40 years. When my children were born, I wasn’t able to crochet as much. But after they got a little older and could do more for themselves, I soon got back into crocheting almost every day. When I was in my 30’s, I started designing a little, but never seriously. Then when we moved from Southern California to Arizona in 1995, I met 2 crochet designers in our small town who shared their designing knowledge with me and helped me get my designing career going! I am so thankful to Nanette Seale and Lucille LaFlamme for encouraging me and being so supportive! Thank you so much! You ladies rock!!! My designing career officially got off the ground when I sold my first crochet pattern to Annie’s in 1999. It was my Snowflake Doily and Coasters Set. I’ve designed several hundred crochet patterns since then and I enjoy designing each and every one of them (some a little more than others, though). You can see all of my published crochet (and now knitting) designs on my Ravelry designer page here. The first conference I ever attended was for the Society of Craft Designers (no longer in existence) in Sept., 2001 in Phoenix, AZ. It was close enough for me to attend without too much cost and I met a lot of crocheters there (I remember Carolyn Christmas and Darla Fanton from that conference). 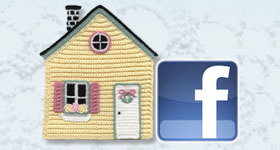 Darla Fanton told me about CGOA (the Crochet Guild of America) and invited me to join. I joined the next year (in 2002) and I haven’t looked back since! Through CGOA I have met so many other crochet professionals, including designers, magazine editors, publishers, etc. It’s a fantastic group of crocheters who are in love with crochet! We support each other, encourage each other, teach each other and have lots of fun at the annual crochet conference! There are local CGOA chapters throughout the US, too. Unfortunately, there is no CGOA chapter near me, but I attend 2 other groups of crochet enthusiasts during the year (monthly and/or weekly) to stay in touch with other crocheters and encourage each other regularly. In Jan., 2002, I attended the HIA (Hobby Industry of America) trade show in Anaheim, CA. It was there that I met Jean Leinhauser and Rita Weiss, who owned American School of Needlework at that time. 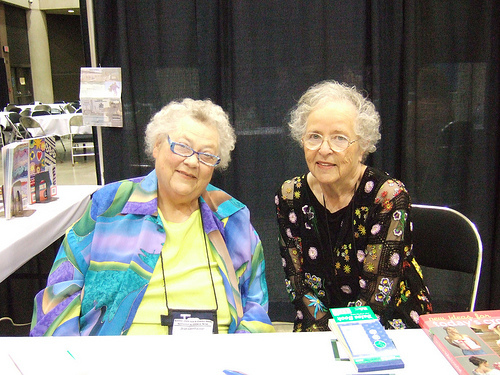 If you haven’t heard of Jean and Rita, just do a Google search and you’ll be in awe of the number of books that they’ve published/produced in their lifetimes! In fact, Jean Leinhauser started Leisure Arts way back when! Two years after meeting Rita and Jean, they were looking for technical editors for their new company, Creative Partners, LLC. I applied for the position and passed their editing test (much to their surprise)! So I was on my way to being a technical crochet editor! Less than 2 years later, I started technical editing for Crochet Today magazine, too. I was kept quite busy editing for both companies and I learned so much about writing a good crochet pattern when I was tech editing a lot. Looking back on those times, I’m not sure how I kept my sanity with so much work to do (I must be getting older)! Anyway, the next addition to my crochet career came when some of my class proposals were accepted for me to teach at the CGOA Conference in 2009. I remember that like it was yesterday! My middle son got married in June, 2009 and the conference was at the end of July. A few weeks before the conference, my husband and I were taking a nature walk nearby and he was taking photos. I had my camera in my hand and before I knew it, I slipped on loose gravel, fell down and broke my left wrist! I couldn’t believe it! How could this happen before I was scheduled to teach at the conference? Would I still be able to teach my classes? Well, the following week, I had surgery to repair my broken wrist. My husband printed and bound the rest of my class handouts and was a HUGE help! So my classes didn’t have to be cancelled after all! With my left arm in a sling, my bags were all packed and I headed to the airport, where I got lots of help with my luggage! Once inside the terminal, I took one look at the escalator (with my arm in the sling) and turned around to find the elevator instead (I couldn’t hold onto the handrail and my carry-on bag with the same hand!). I taught 4 classes at the 2009 conference in Buffalo, NY with lots of help from some wonderful crocheters in my classes (and from Jean Leinhauser, too)! I even did my best to teach my shuttle tatting class to my students “one-handed”!!! I have many fond memories from that conference. My roommate even helped me with some of the “logistics” of getting dressed with one good hand, including how to put on jewelry one-handed! I even modeled the top and skirt that I crocheted to wear at my son’s wedding in the fashion show at the conference that year! I have a few photos that I’d like to share from that conference. This is Jean Leinhauser and Rita Weiss. Sadly, Jean passed away in 2010, but Rita is still producing knit and crochet books. 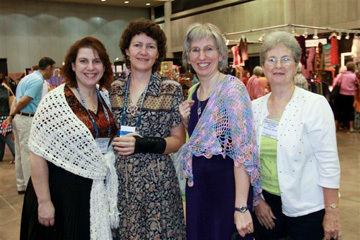 This is my roommate, Shari White, me, Andee Graves and Joyce Bragg waiting to show our crochet designs to the magazine and book editors who were there to talk with the crochet designers. 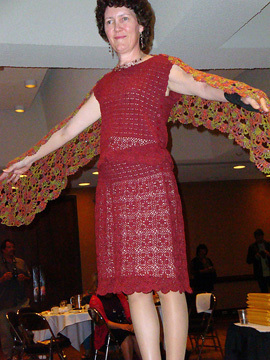 This was me modeling the outfit that I crocheted for my son’s wedding at the CGOA Conference. If you look closely, you’ll see the wrist brace on my left wrist! I didn’t care! It was tons of fun to model the outfit, even if it didn’t come out exactly how I wanted it! Oh, I was modeling the shawl that my roommate, Shari, crocheted from my pattern in Crochet Today magazine, too! Well, that’s the story behind my crochet career. It’s probably more than you wanted to know, but I think it’s fun to find out how some people got their start as professionals in the crochet industry. I hope you’ve enjoyed learning about my beginnings in the crochet industry. What are you planning to do for National Crochet Month? Have you already gotten a start on learning a new crochet technique, starting a project that you’ve always wanted to crochet or buying some new yarn? Please share how you celebrate National Crochet Month in the comments below. This entry was posted in National Crochet Month and tagged National Crochet Month. Bookmark the permalink.